So as I'm writing this on Wednesday gone, I'm assuming I'll have already posted a picture on Instagram (@RayWhoisShe) this morning of what I've bought in Duty Free. Seriously writing in the past for the future, acting like the day it is, is confusing me. Anyway for me one of the major exciting parts of holiday for me is duty free and as soon as I'm through security I'll be running off. The list has been prepped now for about 6 weeks with the occasional tweak however this is what I'm planning on buying. Clarins Gentle Exfoliator - I've been wanting to try Alpha H Liquid Gold however for some reason I've always felt wary about using this, so I'm thinking its gentle counterpart will hopefully have similar results. 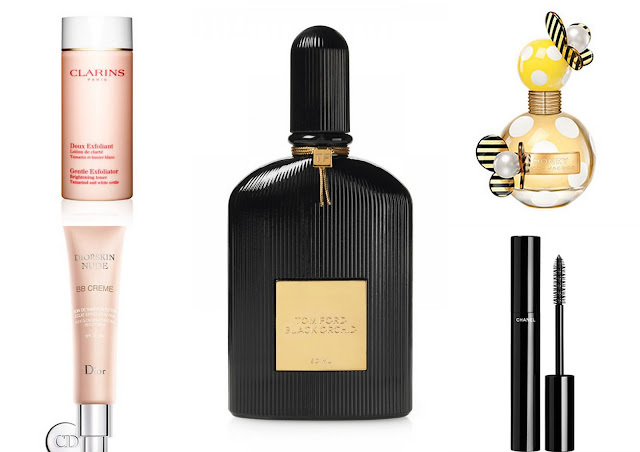 Tom Ford Black Orchid - I'm debating whether to get a 50ml or 90ml bottle of this as I'm just obsessed with it. If you haven't smelt this, next time you're in a department store spray it on a card, let it settle then you'll fall in love. Dior BB Cream has recently been added to the list ever since Tor picked up a sample in House of Fraser in Boro. I'm debating whether to get this or a Chanel foundation, however I'm leaning more towards this as I think I'd get more wear out of it (plus it'll be ideal for a night over in Zante). I'm not really a fan of Marc Jacobs fragrance, I didn't really like Daisy and I've avoided them like the plague. However after seeing his Honey fragrance advertised on everyone's blogs I decided to have a whiff (I love that word) and I really love the fragrance. I'm only planning on getting a 50ml bottle depending on the price, I may just hold off and wait until Christmas. Finally Chanel Volume mascara - I'm really on the fence about buying this as I have quite a few mascaras on the go. I'm going to try and resist buying this (famous last words). If like me you like to spend a fortune in Duty Free before you go check out the online offers and see what prices you can find and see how much they will be in the shops over here, you might be surprised at how much you are/aren't saving. Also I know Biza at Newcastle Airport have an online voucher for £5 off a purchase when you spend £75 or more, which even though its not much, its better than nothing.